If I were ever told, a couple of weeks ago, that I would meet Paul-Loup Sulitzer and be able to ask him for his support, I just wouldn’t have believed it. I was aware though, that Sulitzer had quarters somewhere in Brussels, but I didn’t know where. And simply put, the very idea of meeting him just didn’t really occur to me. This was until three weeks ago, when I incidentally bumped into an old friend of mines, a rap singer, Benny. I was with my son Zackie, and the three of us went to have an ice cream in a famous coffee shop. A couple of days later, Benny called me: “Marc, you know that exactly one week later, my friend Paul-Loup showed up in the same coffee shop. And since I’ve known him for a long time, we chatted around a cup and I told him about you. Do you want to meet him?”. “Are you kidding me”, I said !? On July 21, 2017, the Belgian national feast day, it was noon sharp. I would park my car down Paul-Loup’s apartment, and pick them up, him and his assistant, Supriya, to have a unforgettable lunch (unforgettable for me to the least!). Our lunch lasted till later than 16 PM. I could say a lot of things about what I learnt on that very day, from this genuine globe trotter, close to so many stars and icons, but above all, I was deeply touched by the simplicity and genuineness of the man. 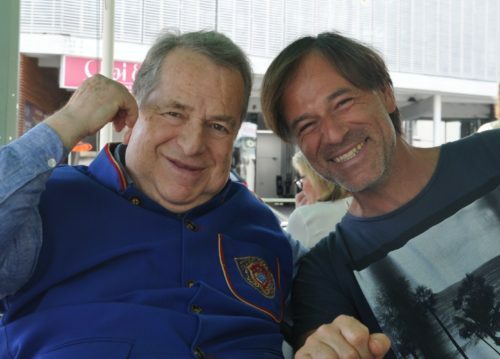 The next day, July 22, which turned out to be Sulitzer’s 71st birthday, I would go again to his dwelling and give him a copy of my book “The Quest of the Mecha-Soul – Vol 1 – The Tenth”. Actually, since then I changed the main title to Mecha-Soul as it turned out that it was difficult for many people to pronounce or remember it correctly. Five days later, Paul-Loup called me. He’d read ten pages and was hooked… He’ll read it till the end, and then let me know what I should do with it. Since then Paul-Loup and I went a couple of times to Lille together, trips during which we discussed Mecha-Soul and its potential future, and he explained to me that what I had created was precisely what the books and film industries were looking for: a great story and even more, a universe. Just before Christmas 2017, Paul-Loup offered me an invaluable present. We were on the road again, when he simply told me “You know, I have written 43 novels, 38 of which are best sellers. I can tell when I get to read a good story, Marc, and yours is definitely a good one!”.